MacDougall, Peter. Lampworked mauve flower with five petals and leaves with central complex cross cane surrounded by stars, ringed with eight placed white and blue anchor canes, all set on a stunning crimson red sodden snow ground. Signature cane in base "PMcD 11". Diameter 2". McDougall, Peter. Yellow lampworked five-petalled flower with central complex cane and green leaves on stem, floating over pink swirl. Six and one faceting (done by the artist). Signature cane in base. McDougall, Peter. Spoke weight with eleven white and orange filligree twists separating complex millefiori canes over a clear cobalt blue ground. Ten complex canes surround the large central setup of white/green florets and complex canes. Signature cane "PMcD" on base. Original label. Diameter 2". McDougall, Peter. Spoke weight with six red/white/blue twists separating 1-2 groupings of red/white/blue stars on black ground. Central setup, also in red/white/blue contains canes marked "WDC 2011". Created for the PCA Inc. biennial convention in Washington DC 2011. Unfaceted. Scratch signed on base "PCA". Original label. Diameter 1 3/4". McDougall, Peter. Spoke weight with six red/white/blue twists separating 1-2 cane groupings of red/white/blue stars on black ground. Central setup, also in red/white/blue contains canes marked "WDC 2011". Created for the PCA Inc. biennial convention in Washington DC 2011. Flat top and pressed, fluted edge. Scratch signed on base "PCA". Original label. Diameter 1 3/4". McDougall, Peter. 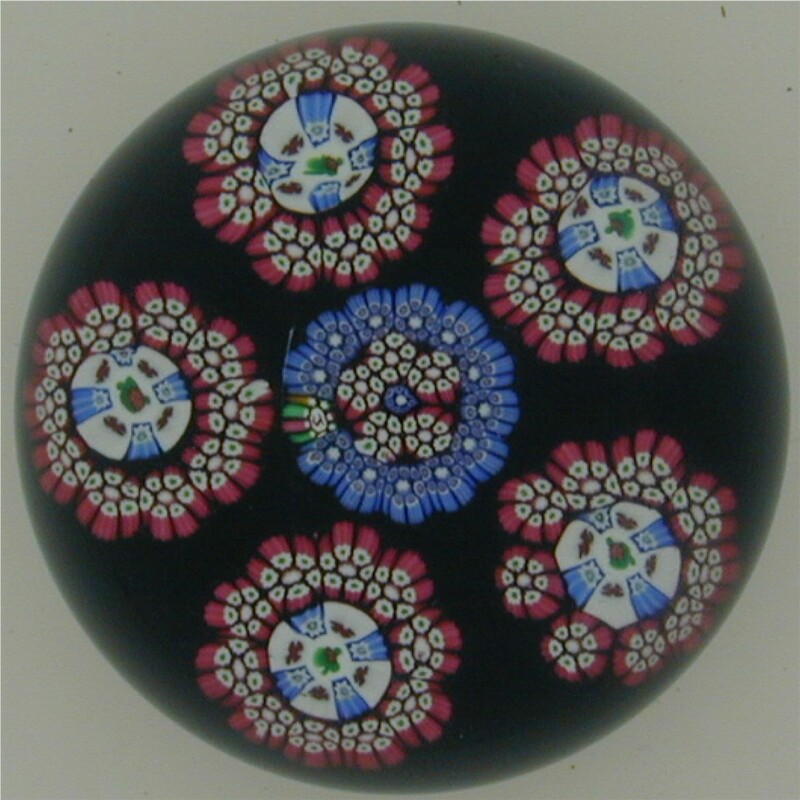 Concentric millefiori with seventeen different complex canes surrounding a central complex cane marked 'PCA 05" on a black ground. Created for the PCA Inc. biennial convention in Appleton, Wisconsin. Visible from the top is a signature cane "PMD". Diameter 1 7/8". Hunter, Michael James. Triple overlay 'crown' of white/grey/black latticino swirls with clown face silhouette canes. Central top complex cane holds "MH" signature cane. Scratch signed on base "M Hunter (Twists Glass) 'Clown 07' No 6420. Diameter 3". St. Kilda four row concentric. "StK" signature cane in center. Manson, William (Scotia of Scotland). Six-pointed star pf complex canes on cobalt blue ground. Unlimited edition, 1980-81. Manson, William (Scotia of Scotland). Orange tea rose with leaves and stem surrounded by 16 spaced concentric complex canes including signature cane. Five and one faceting, star cutting on base. Limited edition 90/200. Strathearn. Large spoke weight, blue and white canes and latticinio on orange ground. Strathearn. Spoke weight with 1-2-2 cane groupings, seven panels separated by white latticino. Seven complex canes surround central orange/white cane. Strathearn. 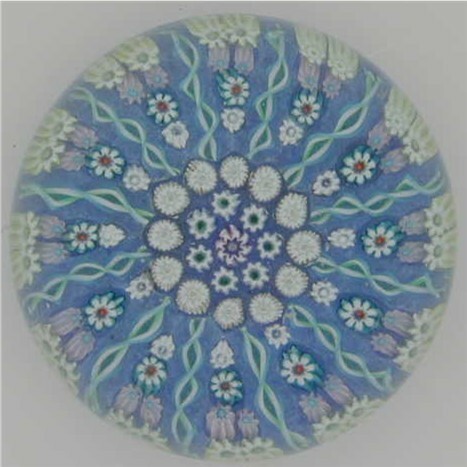 Concentric millefiori on pale yellow ground, diameter 1 1/2", paper label on base, 1.6" diameter, 1.2" height. Strathearn. 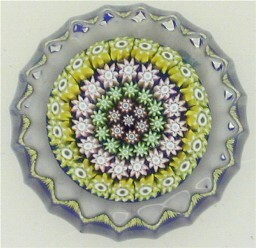 Millefiori with latticino on clear blue ground, flat polished base, 2.4" diameter, 1.9" height. Strathearn. "Ice Pool". A piece of Scottish quartz floats within clear glass. 5+1 facetting. (PSF12). Strathearn. "Crocus". Colour variation from previous weight. Dodds, Chris (Tweedsmuir Glass). Miniature swirl with bubble. Paper label on base. Manson Jr., William. "Red Rose", WM signature cane. Signed on base, 2000. Perthshire. PP2. Medium spoke weight with eleven radial twists, 1-1-2-2 cane groupings and two concentric rings surrounding a central complex cane with a "P" center on a red/brown ground. Hollow ground base. Diameter 2 1/2". Perthshire. PP10 (1969-1973). Five millefiori cane clusters surround a central cane cluster on a transparent green colour ground. Star-cut base. Unsigned. Diameter 2 3/8". Perthshire. PP14. Five millefiori cane clusters surround a central cane cluster on a clear ground. Five side facets and one large top facet. Star-cut base. Central cane has the letter "I" signifying the year it was made (1977). Limited edition. The weight was produced from 1969 with the letter "A" to 1994 with the letter "Z". Perthshire. PP43 (1987-1994). Shotglass with P cane. Perthshire. PP60 (?) (1983-1995). Medium millefiori weight with five radial twists separating 1-2-3-4 cane groupings over a transparent green ground. Large single top facet and hollow ground base. Original label. Diameter 2 1/2". Perthshire. PP75 (1985-1997). 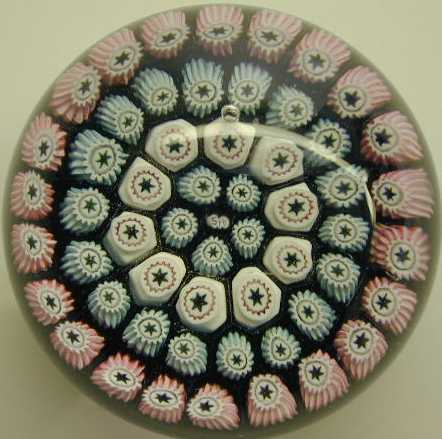 Miniature concentric millefiori weight, central "P" cane surrounded by four rings of canes on a blue ground, pressed fluted edges. Perthshire. 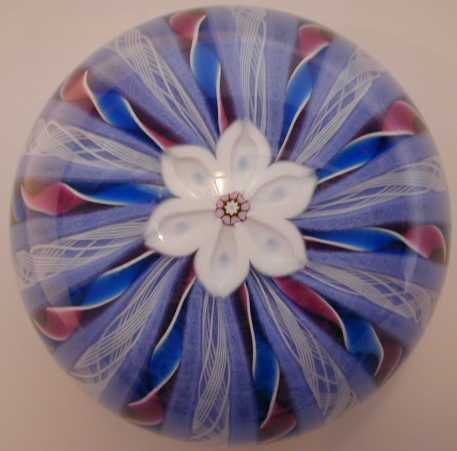 Crown, original paper label on base, Perthshire Paperweights, Crieff, Scotland. Perthshire. 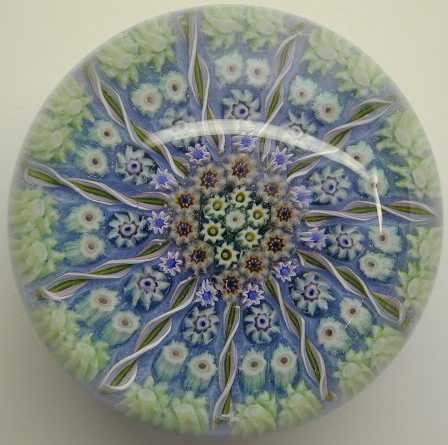 Miniature lampworked flower with blue and white striped petals, green stem and four green leaves surrounded by a circle of pink and white complex millefiori canes. Eight side facets and one top facet. "P" central signature cane. Edition size 400/369 made. Perthshire. "Forget-Me-Not". Nosegay of four blue and white millefiori 'flowers' with four green leaves and two stems over a double spiral lime green latticino cushion. Signature cane in base "P1976". Edition size: 400/397 made. Diameter 3 1/4". Perthshire. 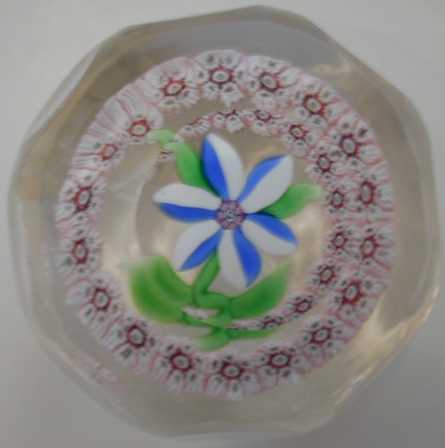 Small perfume bottle with concentric millefiori and aqua "threads" in stopper. Deacons, John (J Glass). Spaced concentric with signature cane. Deacons, John. Produced for PCA 2007 convention in Providence RI. Signature cane on base. Selkirk Glass. "Midwinter", limited edition 342/450 (1987), original paper label on base.